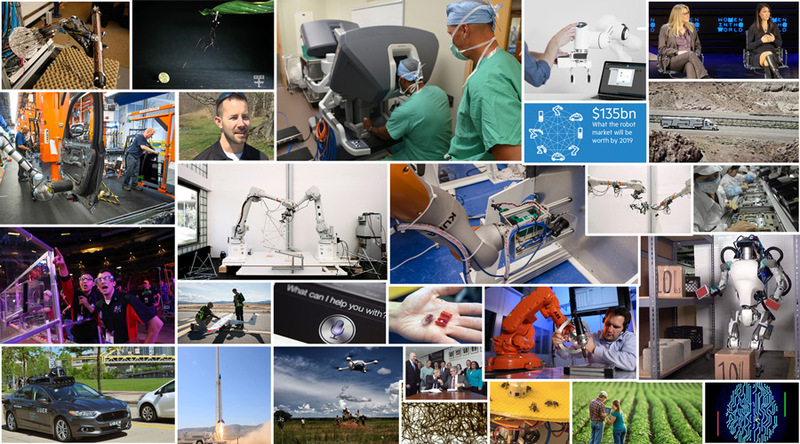 May proved to be another strong month for robotics funding. According to The Robot Report, “13 companies were funded to the tune of $111 million. Four companies were acquired with two of the four reporting selling prices totaling $422 million.” Chinese company Midea offered a $5.2 billion bid for Kuka, to grow their robotics industry. For Kuka, stronger ties to Midea could help lift its revenues in China, one of the cornerstones of the company’s growth strategy. Kuka overall aims to roughly double its revenue to between €4 billion and €4.5 billion by 2020, compared with 2014. European Robotics is also performing well, with EU’s Horizon 2020 funding $179 million in robotics PPPs (Private Public Partnership), according to Europe’s Digital Progress Report. Let’s not forget the highly anticipated purchase involving Boston Dynamics. Rumours swirled that Toyota was in the bidding, with the price of the deal fiercely under wraps despite the rumour of the ‘ink nearly dry’ … then recent news surfaced that Toyota was also in discussions for purchasing Schaft, a Japanese startup company that won the DARPA Robotics Challenge. So potentially a two-company sale on the horizon. The media has also taken notice of this upward trend, with the Financial Times commenting that robotics and artificial intelligence are hot new markets for the financing boom, as more and more robots move from labs into public spheres like hospitals, retail centres. Growth is also taking place in Asia with countries like Japan and China in the early stages of retooling their manufacturing sector, accounting for 69 percent of all robot spending. Speaking of AI investments, the race is on to create better enhanced virtual assistants. At Techcrunch Disrupt, the creators of Siri unveiled their latest AI virtual assistant technology, Viv. Tech giants Apple, Google, Amazon, Facebook and Microsoft, have all invested heavily in artificially intelligent assistants in recent years giving us a preview of what is to come. The technology is the new frontier in how we will use our devices and interact with the digital world. The White House also recognises this shift happening in technology and announced a series of public workshops on artificial intelligence and the creation of an interagency working group that plans to examine benefits and risks posed by artificial intelligence. All events are livestreamed, with workshops hosting artificial intelligence experts from academia and industry in conversation with government officials interested in developing a forward-thinking and effective policy framework. Like the term “robot” itself, artificial intelligence is hard to define (what is intelligence after all?). Robohub hosted a Roundtable examining the evolving nature of the language, deciding that ‘robot’ by definition is fluid, however, there is a tendency to overuse the term robot, which causes confusion in the public about robot capabilities. For example, bots in the media called ‘chatbots’. Most technologists would agree that these software bots are in fact not RObots. The march towards autonomous vehicles continues, now with testing and research of self-driving trucks on highways. Start-up company Otto, led by 15 former Google employees, including eight engineers, think that automating trucks rather than passenger vehicles could be more palatable financially and to regulators. However, automating commercial driving is still controversial. Summer is also time for student challenges and competitions. FIRST (for Inspiration and Recognition of Science and Technology) Championship hosted a 4-day event with more than 20,000 students competing from around the globe, in front of more than 40,000 spectators. MIT hosted a head-to-head battle in the annual Course 2.007 (Design and Manufacturing) undergraduate course in mechanical engineering. Hundreds of spectators watched 32 finalists (from 153) perform. Robots completed various tasks, such as hanging small lanterns on the North Church steeple, pushing bags of tea off the wooden ship, scaling a steep hill to simulate Paul Revere’s ride, and hiding cannonballs under the Old North Bridge. Robohub covered the Airbus Shopfloor Challenge at ICRA in Stockholm, IEEE Robotics and Automation Society’s biggest conference and one of the leading international forums for robotics researchers. Spectators watched as finalists finished 1-hour rounds drilling into sheets of metal, similar to aircraft panels. As reported by Airbus, “In what turned out to be a suspense-loaded two days, spectators saw the whole gamut of emotions driven by catastrophic failures, live coding of new solutions, sheer joy when the drills powered through, and the exhaustion of pulling all-nighters to compete in what was a very tight race.” You can read the winning team story and their ups and downs of the competition while creating their robot. Speaking of ‘drones for good’, The Lancet published a report by Dinsa Sachan on using drones in the health sector that explores a similar theme: looking at the dual nature involving drones in war. As drones are used for surveillance and bombings can these same drones save people, too? It appears drones will be utilised further in public health, potentially revolutionising transportation networks and connecting people to what they need. In a TED blog post, Matternet, UNICEF and Malawi’s Ministry of Information hosted hands-on sessions and a Community Demo Day so the locals could see how the drones work and learn what they’d be carrying. These demos also stressed the importance of HIV awareness, getting tested, and taking antiretrovirals. In public policy news, FAA Administrator Michael Huerta announced the agency is establishing a broad-based advisory committee. The committee will provide advice on the main unmanned aircraft integration issues. He also announced plans to make it easier for students to fly unmanned aircraft (PDF) as part of their coursework, so they will no longer need a Section 333 exemption or authorisation to operate. And lastly, let’s end with something that, at first glance, appears to have taken a page out of a conspiracy theory handbook: a drone seeding rain clouds. Drone America, AviSight and the Nevada Institute for Autonomous Systems explain that using silver iodide particles in the air encourages water molecules to stick together and become rain, with seeding clouds able to increase precipitation by up to 10 percent. However, this isn’t the end of expansive deserts as we know it, as moisture needs to be present in the first place, making it unsuitable for ending drought or stopping wildfires. Robotics in agriculture will be the integral tech on farms as farmers are increasingly under pressure to feed more people. Robots handling crops will not be a strange sight in the years to come, in fact, robots will improve production yield, reduce resources required, and could make farming an exciting high-tech profession. In the EU alone, the organic market grew by 7.4% in 2014 with sales valued at €24 billion. Let’s not overlook the wine! The VINBOT project designed an all-terrain, autonomous rover to improve the accuracy of measurements, scanning leaves in vineyards with greater precision. Also, other emerging technologies, like biological agriculture for roboticists, will contribute to agriculture, or to land management. And to help pollinate this food, researchers are studying bees to make robotic versions that can help beekeepers look after their hives. And in a recent article in Science, Harvard roboticists demonstrate that their flying microrobots, nicknamed the RoboBees can perch during flight to save energy — like bats, birds or butterflies. Researchers at MIT, the University of Sheffield, and the Tokyo Institute of Technology demonstrated a tiny origami robot that can unfold itself from a swallowed capsule. It can also be steered by external magnetic fields, and crawl across the stomach wall to remove a swallowed button battery or patch a wound. A team of researchers at the University of Washington developed an artificial hand that’s built by robotics and trained by artificial intelligence. So far, it’s looking like it may be the most sophisticated artificial hand ever created. Students at University of California San Diego launched a rocket with an entirely 3D-printed engine, beating NASA to the punch. NCCR Digital Fabrication is researching multi-robotic assembly strategies. To create elaborate structures, the robots alternate the order of positioning construction elements, that at the same time also serve as support structures. Out of Germany comes the FRANKA cobot, a robot that can assemble another version of itself right out of the box. According to their website, the FRANKA is the first robot that builds itself. It can assemble its body, connect the pieces, lift up and test its functionalities. Researchers at the Institute for Dynamic Systems and Control and ETH Zurich developed the cool looking Monospinner, a mechanically simple, controllable, flying machine. It has only one moving part, the rotating propeller, and has no additional actuators or aerodynamic surfaces. However, it can still fully control its position in space. And finally, an exciting collaborative initiative in autonomy and robotics between MIT and Lockheed Martin was launched. Teams will focus on innovations and how to improve human/machine teaming and navigation in complex environments. This could be a great indication of more industry/academic joint partnerships in robotics to come.